The geometric shape of the Allure Ring gets a fashion boost with the addition of antiqued rope detailing surrounding the snap settting and outlining the shank. When I’m wanting a different- edgy look this ring is my go to! It’s square-bold setting looks fantastic with just about any Dot. I especially love the solitaires in here. 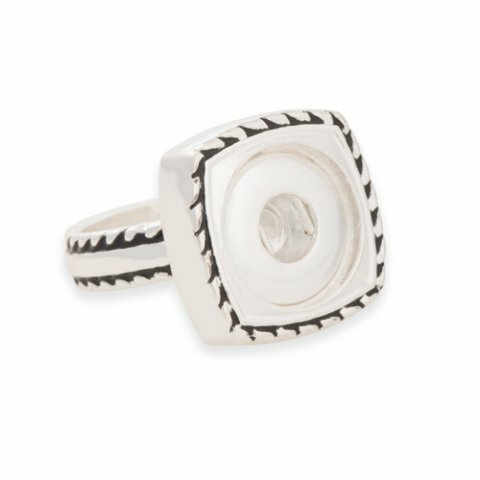 This ring is classic. I love the square option, but it holds an original Dot. The versatility is unique and offers a very elegant look to your hand. I highly recommend this ring! This ring is even more beautiful in person! I love the design & look. The best NEW design this year the ring is absolutely GORGEOUS! My new favorite ring! It has the popular square look, but holds an original Dot, so you have tons of options! I love all the new sparkle Dots in this ring!